I am not a huge fan of ants. Every rainy season they invade our home, finding their way to the dining room table, the boys’ food-splashed chairs, the dirty plates in the dishwasher, the powdered sugar in the pantry. Over the years, we’ve tried numerous ways of disinviting them — sprays, traps, strategically-placed sprinklings of cinnamon, the Clark Pest Control guy. They always come back. It’s gotten so that every time there is heavy rain in the weather forecast, I automatically move the syrup bottle from the pantry into the refrigerator, which we’ve learned from experience is the only truly safe zone in the kitchen. So you’ll understand that I was rather apprehensive when my parents gave Matthew an ant farm for Christmas. “It’ll be fine,” I said, aiming for optimism. “I guess the thing is pretty solidly built, right?” We looked at the box, which said ESCAPE-PROOF in capital letters. That was somewhat reassuring. Then again, that’s what they said about Alcatraz. Last weekend, they arrived. 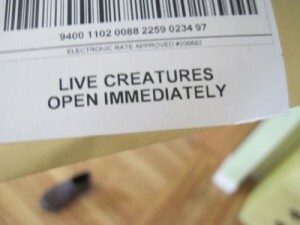 They came in an envelope marked LIVE CREATURES, OPEN IMMEDIATELY , which I found slightly disconcerting. Dad opened the envelope and pulled out a small test-tube-like container. I surveyed it apprehensively from a safe distance, and I got my first shock: the ants were huge. They were positively Brobdingnagian. It looked as if they had been messing with the kinds of substances that keep you forever out of the Baseball Hall of Fame. “The directions say to put the ants in the fridge for fifteen minutes. That will slow them down and make it easier to get them into the farm,” Dad informed me. “Um, okay,” I said, thinking, In the fridge? My one safe zone, breached. As the ants chilled with the milk and eggs, Dad filled the ant farm with white sand. Matthew and Luke watched with rapt attention. Then it was time to introduce the critters into their new habitat. We got them out of the fridge and Dad unscrewed the cap and gently knocked them into the slots at the top of the farm. It quickly became clear that the ants had not been adequately chilled. They were fast little suckers. And it was nearly impossible to get them into the farm without spilling them onto the table. When we dropped one or two ants at a time, we could fairly easily get them to run onto a paper and coax them into the ant farm. But when about ten of them fell out in a clump, panic ensued. They spread in all directions like ball bearings. One of them headed for Lukey, who screamed with laughter; a few ran down the table leg; some of them ran over Dad’s hand and up his wrist. It was chaos trying to corral them all, and I’d have just smashed them with a Kleenex if they were normal ants and not, you know, pets. Thinking strategically, I trapped a few on the floor by inverting bowls over them and I managed to help Dad get the other errant creatures off of the table with the help of the paper and a straw. The boys thought it was one of the funniest things imaginable. Which it was, except that I was also worried that a few ants had escaped undetected. I had visions of them mating with our household ants to create a Super-Race of ants, terrifying creatures who would come into the bedroom during the night and carry my sleeping body away, like a picnic watermelon in a cartoon. With the ants finally sealed in their new habitat, it was time to feed them. That was news to me. I had somehow been under the impression that they survived on air, or ate each other, or something, but in fact, it turns out that we have to water them every two days and feed them once a week. In other words, they are a wonderful lesson in responsibility for Matthew or, perhaps more realistically, for me. Where to put them was also a conundrum. It had to be high enough that Luke could not get his hands on the farm and open the hatches; it had to be a place hidden enough that they would not repulse our guests and yet obvious enough that we would not forget to feed them. 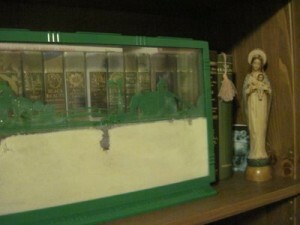 We settled on the top shelf of the bookcase in Matthew’s room, where they are watched over by this small statue of Mary, whom I now like to think of as Our Lady of the Ants. With the ants settled onto their new perch, Dad and I peered in. “According to the directions, they’ll be pretty lethargic for the first few hours,” said Dad, and the directions were right. The ant farm looked about as lively as a college campus on a Sunday morning. But since then — and it’s been a full week — those critters have perked up. They’ve been building tunnels, long, interconnected ones, and piling sand over the little plastic bridge on the ant farm. They are in fairly constant motion, and I have to admit, they are pretty cool to watch. Creepy, but cool. And Matthew is enjoying them. 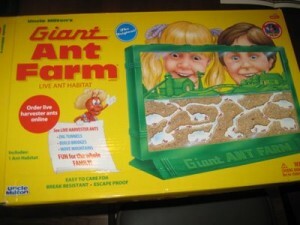 One evening we put the ant farm on the table and just sat and watched it for a long time. Matthew was intrigued by the ants, questioning me often about their motives, following their movements. As apprehensive as I was about welcoming ants into the family, I will say that it is gratifying to see him stare at them with the same attention he normally reserves for the games that Daddy occasionally lets him play on the tablet. Is this the beginnings of a career in entomology? The dawning of an appreciation for the wonders of the created world? A vivid lesson in teamwork? Maybe so. He is certainly happy to have them in his life. As for me, I’m still trying to figure out who will feed the ants when we go on vacation. I think I’ll ask Dad. This entry was posted in Adventures in Parenting. Bookmark the permalink. We get ants in our kitchen when it rains, too. Your post this morning had me laughing out loud. One thing my boys have not done (yet) is to have an ant farm. This post may just give them the encouragement they are looking for! 🙂 Absolutely love the Our Lady of the Ants. God loves all creatures, great and small. Thanks for starting my day with a laugh. I have yet to come up with a reply. I am still thinking of the fast moving ants! This had me laughing while at the same time wondering what the world of boys has in store for me (I have two boys, twins that are almost 8 months old). I’m not a fan of ants either, but I can see how his would be so fascinating. Thanks for the laugh!! I’ve been thinking about this since I read it yesterday… what a great experience for your kids and your family. 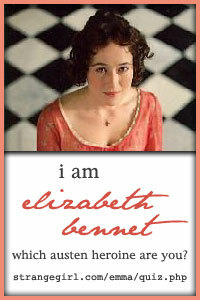 Even from someone like me – who like you – has been very ant averse!! So glad folks enjoyed the story. 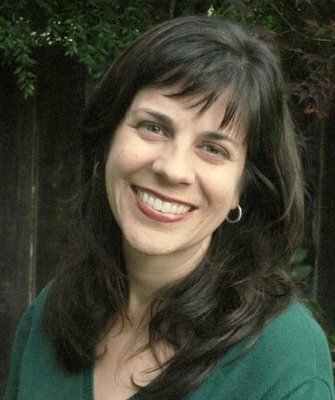 It was one of those mom-experiences that just cries out to be blogged. Motherhood is definitely stretching me out of my comfort zones ….